Sachin Pilot flayed the government over issues like unemployment, corruption, farmer suicides. 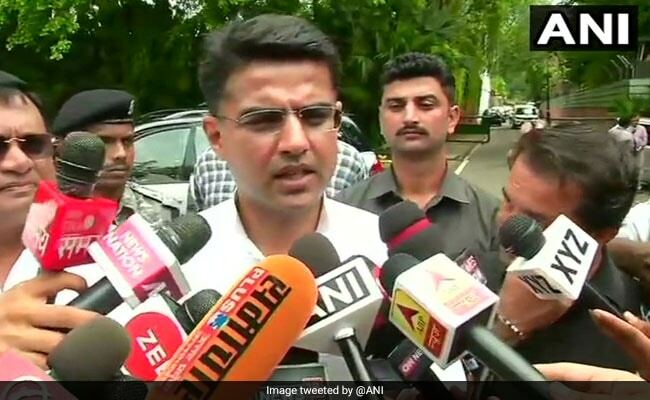 Pitted against the BJP's lone Muslim candidate in the state assembly polls, Rajasthan Congress chief Sachin Pilot has a poser for BJP -- Will Uttar Pradesh Chief Minister Yogi Adityanath come to Tonk to seek votes for Yoonus Khan. On his campaign trail covering nine Panchayats and the city throughout Wednesday, Mr Pilot accused BJP of playing politics of caste and religion. In his campaign speeches one after another in Tonk, Mr Pilot is pitching his electoral contest with Mr Khan as a battle of ideologies and not of individuals. "Be it Yoonus Khan or Chenghiz Khan, it doesn't matter. Pilot will win the polls," said Jagdish from Mor Bhatiyan village where Pilot rode a bullock cart in a show of people's affection towards him. Another supporter at the gathering, Meghraj, said Mr Pilot's win was a foregone conclusion and he would also be the chief minister of Rajasthan. During his Wednesday campaign, people in villages welcomed Pilot in novel ways -- from making him ride a bullock cart and a rath to weighing him with fruits. Mr Pilot happily obliged and also asked the people of Tonk at all his meetings to ensure that his victory margin is the biggest in the state. Beginning his day's campaign with Ariyali gram panchayat, Mr Pilot moved from one panchayat to another and at all meetings launched a scathing attack on the Vasundhra Raje government. "There is a BJP government at the Centre and in the state. People had hoped for development. But it makes me very sad that for the first time (in the state) farmers had to commit suicide. This is a blot on our society," he said at Ariyali. "Are you getting urea? Prices are skyrocketing, petrol and diesel prices are also touching record heights. How much does a gas cylinder cost now? It costs Rs 1,000," he said. At all his election meetings, Sachin Pilot flayed the government over issues like unemployment, corruption, and farmer suicides. Speaking in Hamirpur Panchayat, Mr Pilot said that after he filed his nomination papers and the BJP fieded Yoonus Khan, he was asked what would he do. "I said I will sit back and see that whether Yogi Adityanath will come to Tonk to ask for votes for him (Khan) or not," he said to a rapturous applause. Mr Pilot's swipe came as the BJP's move to field Khan, who is the party's lone Muslim candidate in the state, was seen as an attempt to cut into the votes of Muslims which are about 55,000 in number.